I think they've updated their database with more photos! Here are the photo ID numbers for the shirt (BRM 31/2)(skjorte) from Guddal, including close-ups of the neck. I finished this a couple of months ago, but hadn't posted about it yet. All of the fabric used was from my stash, it's a greeny-blue 2/2 wool twill, lined with very cheap and thin ramie. Most of the seams trimmed with yellow silk tabby strips, with the exception of the front triangular gores, and the front, neckline and cuffs are trimmed in wool 'fake fur'. Inga Hägg. 1983. "Viking Women's Dress at Birka: A Reconstruction by Archeological Methods", in Cloth and Clothing in Medieval Europe (Heinemann Educational Books); 316-350.
for the ideas of fur trimming and the overgarment being often lined, shaped and gored. The front triangular gores weren't originally part of the plan, but since I was trying to wrap a rather tubular garment around a non-cylindrical body, things gaped a bit so, like some extant kirtles, I added gores so things would sit nicer. Everyone else I've loaned it to for wearing looks stunning in it, so I can only hope I do, too. I could get used to this whole upper-middle class Norsewoman look! Judith Neukam 2011. "Zero Waste: Simple approaches to sewing garments with nary a leftover scrap" Threads no. 155 pp. 66-71. 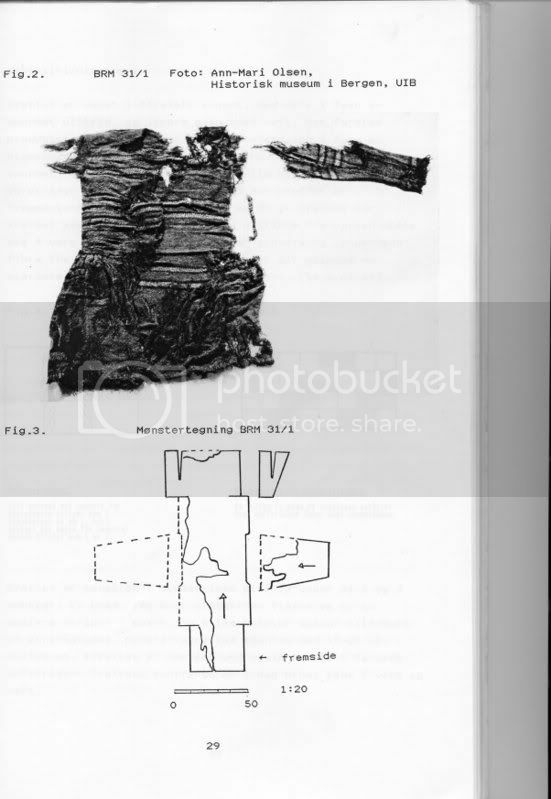 The focus on the article is not about historical dress, but efficient cutting layouts. Still, on page 67 it suggests that 'zero waste' layouts can be found in historic dress, and it gives three examples; 'the viking dress', 'the bog coat', and 'the one-yard apron'. I'm only going to comment on the first two. They essentially are a short paragraph describing the pattern, and a diagram of the cutting layout. It assumes that people are able to easily interpret from diagram to garment, which may not be the case. Hägg, I. 2006. Methodische Probleme der Erforschung ur- und frühgeschichtlicher Gesellschaftsstrukturen am Beispiel Birka [PDF] Archäologie 2000: Festschrift für Helmut Ziegert (Hamburg: Books on Demand) pp. 155-185 [159-189 in PDF] ISBN: 3-8334-6736-3. Weirdly enough, I didn't find it searching for any of those things, I found it while trying to figure out what colour the silk fragments were from grave Bj 824. The answer is "golden-yellow". Jutland, Denmark. Viking period, probably lOth century. Danish National Museum, Copenhagen." on page 5. And a colour photograph of the amulet is on the Viborg Historie site. "A small bronze frog from the 900s, found in a grave at South Teglgård. Note that the frog displays female attributes. It is thus a fertility amulet." For the main, cloaky-things, including a dress-pin-pair-fastened shawl, a ruana (I'm confused about the rest, so I'll focus on the cloak), and a cloak I can't figure out how it stays on. And for dessert, a stripey naalbinded shawl. I'm sure that Elizabeth Wincott Heckett is an excellent archaeologist, but flicking through Viking Age Headcoverings from Dublin, how can she get the literary comparisons so... weird? A little bit about the Guddal tunic... it has sort-of pleated-looking side-insert-gore-things! A Norwegian fashion article, mentioning just how old tunics are, with a reconstruction drawing. 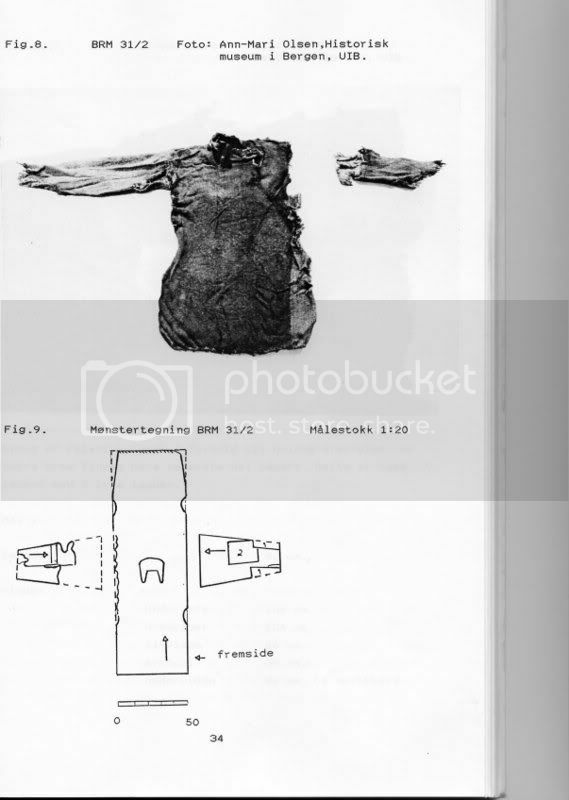 And, the Vitenskapsmuseet has put all of their issues of SPOR before 2005 online for free, number 2 from 1997 has an article by Marianne Vedeler Nilsen that has black and white photos of the tunic, including an interesting split-side-gore-thing. And there's are amber Valkyries? Where!? How can such a brief blurb be simultaneously so useful and so irritating. Can someone who isn't me, and skeptical, double check these two things? Is the photograph from the Danish National Museum in this handout about '10th century' bead-hangers awfully similar to the drawing of the 7th century configuration on this page of "Eine untypische Trageweise" [A non-typical way of wearing]? Down to the colours/shading of the beads? Had a lightbulb moment yesterday, about what on Earth Annika Larsson's press release, about her rather odd Viking Age dress theory, was saying. It isn't "glittering bits of mirrors," it's glittering bits of mica and glass and gold and gilded leather. A. Geijer. 1983. 'The Textile Finds from Birka' in Cloth and Clothing in Medieval Europe: Essays in Memory of Professor E. M. Carus-Wilson (Heinemann Educational Books); 80-99. "Another kind of stitch was termed Slingenstitch, perhaps retranslatable as 'twined wire technique'. This is unique to the best of my belief.... This technique was used by itself or together with plaiting to make a kind of 'fold' - reminiscent of the setting of a jewel -- for mounting pieces of thin mica, foliated glass, sheets of gold or gilded leather." So where is the 'mirror' part probably coming from? Foliated glass, where you cover one side of a piece of glass with foil, is how mirrors were made. Apparently backing your glass with gold leaf looks like this. Very shiny, huh? Apparently it's still used by very very rich people for tiling.